KRS CPAs has been honored with a 2018 Inc. Best Workplaces Award. 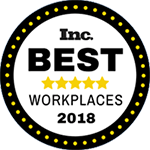 Inc.’s Best Workplaces Award recognizes successful small- and mid-sized businesses that value company culture, offer standout employee benefits, and prioritize employee well-being. “We’re very proud of being recognized as one of Inc.’s Best Workplaces in 2018. 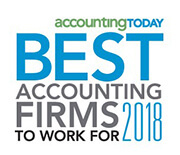 We strive to create a positive work-life balance for our employees, creating a family atmosphere and team environment at the office, and rewarding staff with competitive salaries and generous benefits,” said Managing Partner Maria Rollins, CPA, MST. More than 1,800 companies (and 81,365 employees) of all sizes and industries were nominated for Inc.’s Best Workplaces Award. Once nominated, each company surveyed all employees, covering topics such as trust in senior leadership, career development, change management, and benefits and perks. In addition to analyzing employee sentiment, this study takes into account financial and nonfinancial elements of corporate culture. Pointing to some of the firm’s perks, KRS Partner, Gerald Shanker, explained, “We have created a relaxed environment. We’ve implemented a Flexible Work Program — there are no mandatory hours during tax season. Employees can set their schedule for the work week as long as they are working the core hours of 10am to 3pm. Staff can work from home as needed and have unlimited paid time off. We offer Casual Fridays and Summer Fridays and during tax season, Tax Relief Fridays, featuring different activities, such as corn hole tournaments, sundae bars, chair massages, games with prizes, and happy hours,” he added. 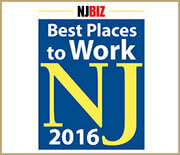 In addition to the Inc. Best Workplaces Award, KRS has been honored by NJBiz as one of the Best Places to Work in New Jersey for multiple years, has been named one of the Best Firms to Work For by Accounting Today, won the NJBIA Awards for Excellence for Outstanding Employer, and was a winner in the Best Practices in leadership competition by CIANJ and COMMERCE magazine. For more information about our business valuation, accounting, tax planning, management consulting, estate planning, and bookkeeping services, please visit krscpas.com or call (201) 655-7411. For job opportunities at KRS CPAs, click here.